Figure 1.1 is a schematic of a simple distribution network with distributed generation (DG). There are many characteristics of this network that differ from a typical passive distribution network. First, the power flow is not unidirectional. The direction of power flows and the voltage magnitudes on the network depend on both the demand and the injected generation. Second, the distributed generators give rise to a wide range of fault currents and hence complex protection and coordination settings are required to protect the network. Third, the reactive power flow on the network can be independent of the active power flows. Fourth, many types of DGs are interfaced through power electronics and may inject harmonics into the network. Figure 1.1 also shows a control scheme suitable for achieving the functions of active control. In this scheme a Distribution Management System Controller (DMSC) assesses the network conditions and takes action to control the network voltages and flows. The DMSC obtains measurements from the network and sends signals to the devices under its control. Control actions may be a transformer tap operation, altering the DG output and injection/absorption of reactive power. Figure 1.2 shows the DMSC controller building blocks that assess operating conditions and find the control settings for devices connected to the network. 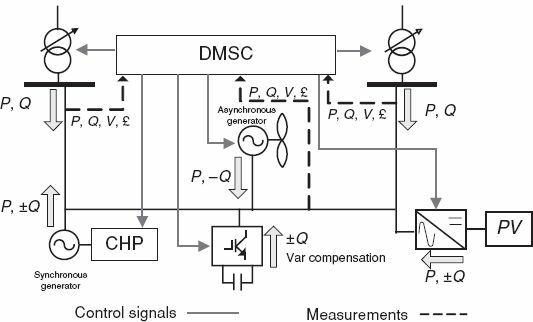 The key functions of the DMSC are state estimation, bad data detection and the calculation of optimal control settings. The DMSC receives a limited number of real-time measurements at set intervals from the network nodes. The measurements are normally voltage, load injections and power flow measurements from the primary substation and other secondary substations. These measurements are used to calculate the network operating conditions. In addition to these real-time measurements, the DMSC uses load models to forecast load injections at each node on the network for a given period that coincides with the real-time measurements. The network topology and impedances are also supplied to the DMSC. The state estimator (described in Chapter 7) uses this data to assess the network conditions in terms of node voltage magnitudes, line power flows and network injections. Bad measurements coming to the system will be filtered using bad data detection and identification methods. When the network operating conditions have been assessed, the control algorithm identifies whether the network is operating within its permissible boundaries. This is normally assessed by analysing the network voltage magnitudes at each busbar. The optimisation algorithm is supplied with the available active control options, the limits on these controls and the network operating constraints. Limits on controls are the permissible lower and higher settings of the equipment. Operating constraints are usually voltage limits and thermal ratings of the lines and equipment. 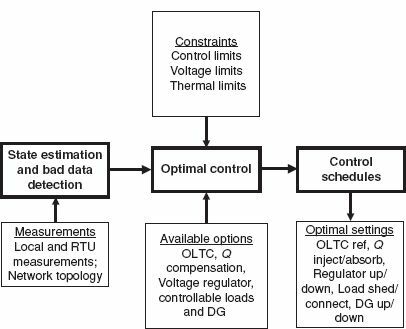 The optimal control algorithm calculates the required control settings and optimises the device settings without violating constraints and operating limits. reconfigure the network by opening and closing circuit open points. Distributed energy resources (DER) such as micro-generation, distributed generation, electric vehicles and energy storage devices are becoming more numerous due to the many initiatives to de-carbonize the power sector. DERs are too small and too numerous to be treated in a similar way to central generators and are often connected to the network on a ‘connect-and-forget’ basis. The concept of a Virtual Power Plant (VPP) is to aggregate many small generators into blocks that can be controlled by the system operator and then their energy output is traded . Through aggregating the DERs into a portfolio, they become visible to the system operator and can be actively controlled. The aggregated output of the VPP is arranged to have similar technical and commercial characteristics as a central generation unit. The VPP concept allows individual DERs to gain access to and visibility in the energy markets. Furthermore, system operators can benefit from the optimal use of all the available capacity connected to the network. The size and technological make-up of a VPP portfolio have a significant effect on the benefits of aggregation seen by its participants. For example, fluctuation of wind generation output can lower the value of the energy sold but variation reduces with increasing geographical distance between the wind farms. If a VPP assembles generation across a range of technologies, the variation of the aggregated output of these generators is likely to reduce. The philosophy of a perfect power system differs from the way power systems traditionally have been designed and constructed which assumes a given probability of failure to supply customers, measured by a reliability metric, such as Loss of Load Probability (LOLP). Consideration of LOLP shows that a completely reliable power system can only be provided by using an infinite amount of plant at infinite cost. enhance quality of life and improve economic productivity. The development of the perfect power system is based on integrating devices (smart loads, local generation and storage devices), then buildings (building management systems and micro CHP), followed by construction of an integrated distribution system (shared resources and storage) and finally to set up a fully integrated power system (energy optimisation, market systems and integrated operation). serves millions of customers and has an intelligent communications infrastructure enabling the timely, secure and adaptable information flow needed to provide reliable and economic power to the evolving digital economy. To realise these attributes, an integrated energy and communication systems architecture should first of all be developed. This will be an open standard-based architecture and technologies such as data networking, communication over a wide variety of physical media and embedded computing will be part of it. This architecture will enable the automated monitoring and control of the power delivery system, increase the capacity of the power delivery system, and enhance the performance and connectivity of the end users. In addition to the proposed communication architecture, the realisation of the IntelliGridSM will require enabling technologies such as automation, distributed energy resources, storage, power electronic controllers, market tools, and consumer portals. Automation will become widespread in the electrical generation, consumption and delivery systems. Distributed energy resources and storage devices may offer potential solutions to relieve the necessity to strengthen the power delivery system, to facilitate a range of services to consumers and to provide electricity to customers at lower cost, and with higher security, quality, reliability and availability. Power electronic-based controllers can direct power along specific corridors, increase the power transfer capacity of existing assets, help power quality problems and increase the efficient use of power. Market tools will be developed to facilitate the efficient planning for expansion of the power delivery system, effectively allocating risks, and connecting consumers to markets. The consumer portal contains the smart meter that allows price signals, decisions, communication signals and network intelligent requests to flow seamlessly through the two-way portal. Wind Power Storage: A 1 MW battery energy storage system to demonstrate long-term emission reductions and help to reduce impacts of wind variability. Neural Networks: A state-of-the-art system that helps reduce coal slagging and fouling (build-up of hard minerals) of a boiler. Smart Substation: Substation automation with new technologies for remote monitoring and then developing an analytics engine that processes data for near real-time decision-making and automated actions. Smart Distribution Assets: A system that detects outages and restores them using advanced meter technology. Smart Outage Management: Diagnostic software that uses statistics to predict problems in the power distribution system. Plug-in Hybrid Electric Vehicles: Investigating vehicle-to-grid technology through field trials. Consumer Web Portal: This portal allows customers to program or pre-set their own energy use and automatically control their power consumption based on personal preferences including both energy costs and environmental factors. Southern California Edison (SCE)’s Smart Grid strategy encompasses five strategic themes namely, renewable and distributed energy resources integration, grid control and asset optimisation, workforce effectiveness, smart metering, and energy-smart customer solutions . SCE anticipates that these themes will address a broad set of business requirements to better position them to meet current and future power delivery challenges. By 2020, SCE will have 10 million intelligent devices such as smart meters, energy-smart appliances and customer devices, electric vehicles, DERs, inverters and storage technologies that are linked to the grid, providing sensing information and automatically responding to prices/event signals. SCE has initiated a smart meter connection programme where 5 million meters will be deployed from 2009 to 2012. The main objectives of this programme include adding value through information, and initiating new customer partnerships. The services and information they are going to provide include interval billing, tiered rates and rates based on time of use.